Charles Reed Bishop, husband of Kamehameha Schools founder Bernice Pauahi Bishop, was a prominent and well respected citizen of the Hawaiian Kingdom who signed the oath of allegiance to the kingdom on February 27, 1849. 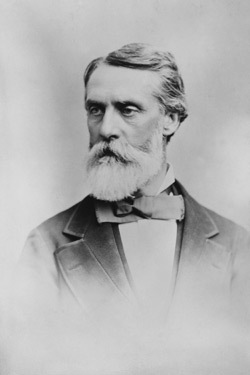 Born January 25, 1822 in Glens Falls, New York, Bishop, with his friend William Little Lee, arrived in Hawai‘i in 1846. Lee was a lawyer and became a loyal citizen in the kingdom. Bishop easily found work, first at Ladd and Company, a mercantile and trading establishment, then at the U.S. Consulate in Honolulu. Bishop was appointed Collector General of Customs in 1849. Bishop met Bernice Pauahi Pākī at the Chiefs' Children's School where she was a student. They married in 1850 despite the opposition of Pauahi's parents who wanted her to marry Lot Kapu‘iwa (later, Kamehameha V). Their home, Haleakalā, became the "greatest centre of hospitality in Honolulu." They graciously hosted royalty, visiting dignitaries, friends and neighbors as well as engaged in civic activities such as organizing aid to the sick and destitute and providing clothing for the poor. The Bishops attended church regularly, enjoyed concerts and traveling. They were very compatible and greatly interested in each other's endeavors. Their only marital disappointment was not having children. I know you all loved her, for nobody could know her at all well and not love her. For myself I will only say that I am trying to bear my loss and my loneliness as reasonably as I can looking forward hopefully to the time when I shall find my loved one again. Primarily, Bishop was a banker. He founded Bishop and Company, which is now First Hawaiian Bank, in 1858. An astute financial businessman, he became one of the wealthiest men in the kingdom from banking, agriculture, real estate and other investments. He also sat on the boards of many charities and donated generously to more than 30 Hawai‘i schools, hospitals, churches and social welfare organizations. Queen's and Kapi‘olani Hospitals, Salvation Army, Hawaiian Historical Society, and Young Men's Christian Association were a few of his beneficiaries. Bishop believed in the transforming power of education and supported a number of schools. 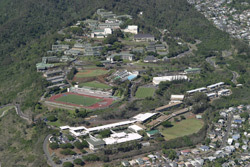 Punahou, Mills Institute (now known as Mid–Pacific Institute), St. Andrews Priory and Sacred Hearts Academy, for example. He not only contributed money to his causes, he provided sound advice and financial expertise. He even sent presents of food or clothing to schools like Kawaiaha‘o Seminary at Christmas, "It is my wish that Mr. Raupp should send them plenty of mutton…also that they should have two turkeys or some ducks, some oranges and cakes…"
The work for good that he did in lifewill abide with us. As a philanthropist, I have known none greater than he. —Eulogy by Reverend H.H. Parker, Kawaiaha‘o Church, 1915. Bishop is best known for his generous contributions to his wife's legacy, the Kamehameha Schools, and the founding of the Bernice Pauahi Bishop Museum. — C.R. Bishop letter to Samuel Damon, 1911. 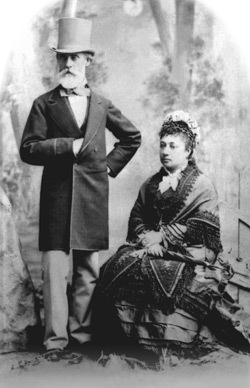 Immediately after Pauahi's death in 1884, Bishop, as one of five trustees she appointed to manage her vast estate, set in motion the process that resulted in the establishment of the Kamehameha Schools in 1887. In December 1885, Bishop had been elected president of the Board of Trustees by the other trustees. Because Pauahi's estate was basically land rich and cash poor, Bishop contributed his own funds for the construction of several of the schools' initial buildings on the original Kalihi campus: the Principal's House (1887), the Preparatory Department (1888), Bishop Hall (1891), part of the funding for the construction of the Girls School (1894) and Bernice Pauahi Bishop Memorial Chapel (1897). He also deeded back to her estate all the lands that she had given him in her will. Although Bishop relocated to San Francisco in 1894 he continued to communicate with Kamehameha trustees on school policy, finance, admissions, Founder's Day and other matters until he died (June 7, 1915). As promised, Bishop founded the Bernice Pauahi Bishop Museum in 1889 as an enduring memorial to his wife. Pauahi had inherited many irreplaceable heirlooms from her parents and her cousin Ruth Ke‘eliko¯lani; feather lei and capes, kāhili, niho palaoa, kapa, lau hala mats, stone and bone implements and calabashes. Queen Emma also willed her priceless antiquities to Bishop who turned her collection over to the museum. Bishop himself added many more collections by "means of negotiation, trade, gift, and purchase" from all around the world. He contributed a "splendid collection of shells," 1500 specimens for a Herbarium, and a stamp collection called Hawaiian Postage and Revenue Stamps, Postal Cards, and Envelopes. He was glad when the museum acquired items like the "Lady Franklin" cape which was "#8230;large, and in excellent condition." Today, Bishop Museum has the largest and finest collection of Hawaiian feather work in the world. Mauna‘ala, the Royal Mausoleum in Nu‘uanu, was completed in 1865 to shelter the remains of Hawaiian royalty. 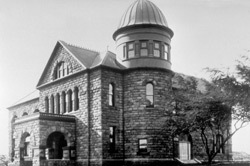 The building that is now used as a chapel was intended for the storage of the caskets. By the time Pauahi died in 1884, the mausoleum was crowded with caskets. Bishop built an underground vault for Pauahi and about 23 members of her royal ‘ohana, the Kamehameha dynasty. In 1887 their coffins were ceremonially transferred from the mausoleum to the new underground vault. Along with Pauahi and her parents, Pākī and Konia, four kings and four queens were laid to eternal rest. Bishop was reunited with his beloved wife on June 23, 1915 at Mauna‘ala in the vault of the Kamehamehas. 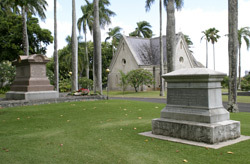 A year later, a stone monument was erected adjacent to the Kamehameha tomb to honor the life and memory of Charles R. Bishop. It was inscribed "Builder of the State—Friend of Youth—Benefactor of Hawaii." Bishop, through the Charles R. Bishop Trust established in 1895, instructed his trustees to expend: "Such sum as may be necessary for the care, repair, maintenance and improvement of the tomb, monument and grounds in Nu‘uanu, in said City of Honolulu, where are deposited the remains of my late wife and other Hawaiian Chiefs."